Guardian Monitor is an essential service for any business, providing advanced monitoring technologies to create a proactive approach to your environment. By utilising Guardian Monitor, businesses can know about upcoming issues and have them resolved before they occur, ensuring availability to your critical services. Add on Guardian Remote with Guardian Monitor to connect to endpoints in seconds. Fast and stable connections to Windows and Mac OSX devices. Perfect for technical support service delivery, or utilised with Guardian Managed to get issues sorted fast! 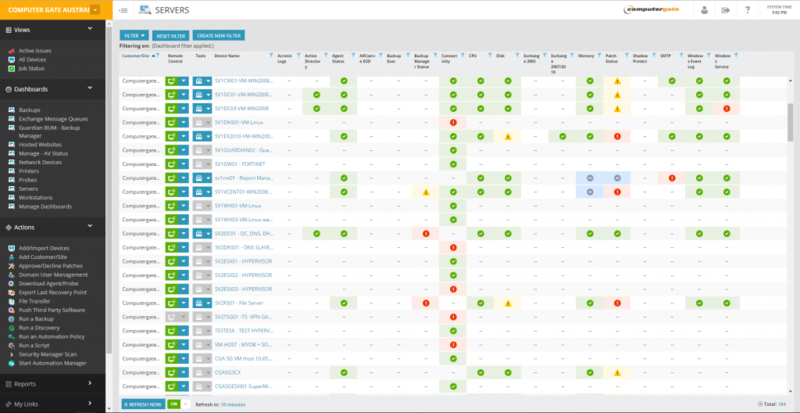 Monitor and manage the critical services in your environment with customizable thresholds to receive warnings before they become failures. Save both time and money with a proactive methodology. Get access to customizable reports to frame the state of your environment in real time, a point in time for reference. Example of reports includes Hardware and Software inventory reports as well as capacity planning reports for further proofing your infrastructure. process to all the endpoints. Microsoft updates and third party updates included. Reduce overheads and improve effciencies by automating tasks that would normally have to be completed manually. Guardian Monitor is a scalable product, that can be customized to fit both small businesses or large multi site environments.